I realized recently that I haven't shared a recipe post since MARCH! And even then, it had been since before Valentine's Day that I shared other treats! What is this madness? I don't know what it is, guys, it just is what it is. I'd hate to remove baking concoctions from the blog altogether as it's such a big part of my world and is still part of this blog's mission. 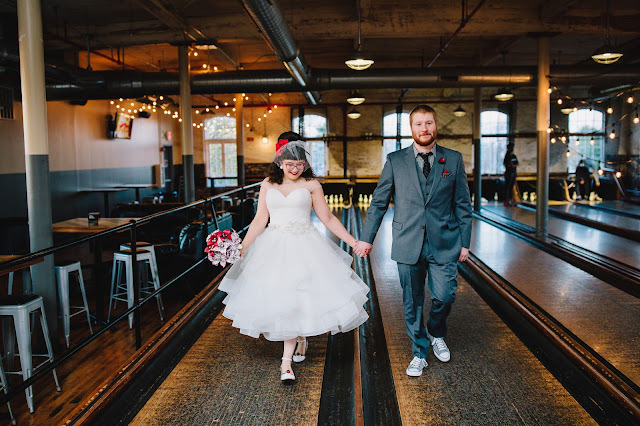 I am not just a style blog. I focus on style mostly, especially the last month or two, but I also try to share great recipes as well as what I am reading. I'd hate to just eliminate the food part and turn 100% into a style blog. Hopefully, the lack of sweets has been because of my schedule and not because I'm just losing my sweet tooth (HAHA, never!). As many know, April and May were kind of insane. I really only spent 2 weekends of April at home due to work trips and since all of my baking happens on weekends or during my downtime, none of that really happened in the past few months. 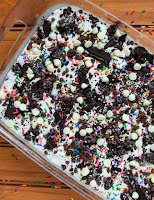 I decided to end this dry spell of desserts with this epically awesome one that I made for Memorial Day weekend at my parents' house: No Bake Oreo Dump Cheesecake. 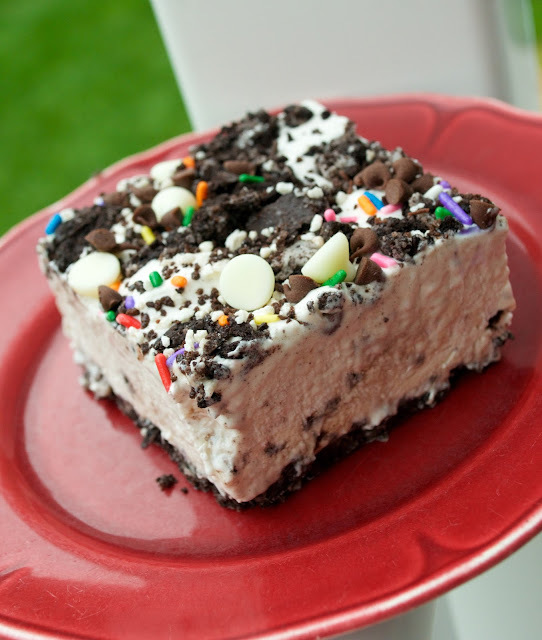 It's not totally an original of mine - I spotted this recipe recently for a cake batter Oreo dessert and I thought it looked delicious but wanted to put my own spin on it. So I renamed it (because though it's a cheesecake, everything is sort of dumped into a big pan and frozen together - boom! Dump Cheesecake! ), left out the cake batter element (does fake cake batter flavored desserts bother anyone else? I just can't), and instead amplified the good stuff - the Oreo-ness of it all! But, Sara, wasn't your last recipe an Oreo one? You smartypants, it sure was! Geeze, you're kinda monotonous - don't you think you should share something else? Um, excuse me, but I don't need this negativity in my life. If you're a hater, see you later! Because I love me some Oreo desserts - and really, who doesn't? 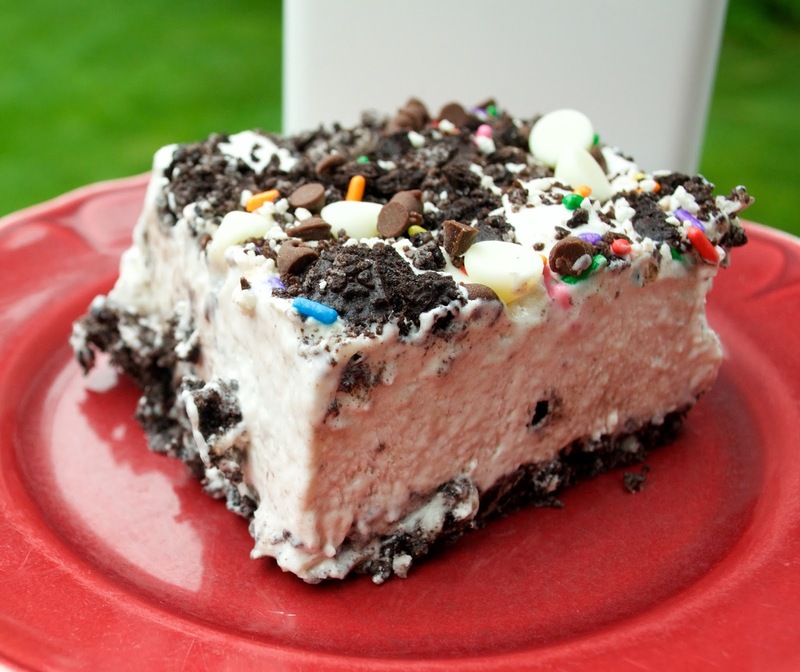 The Oreo is so freakin' versatile! Especially with all the different flavors they have now. Yet, here I am, using just the classic. What can I say? I still prefer the original the most. DON'T JUDGE ME! Fun fact - this dish belonged to my great grandmother! Anyway, let's re-focus here. Your "crust" is basically crushed up Oreo's on the bottom of the pan with melted butter drizzled all over. Then you mix up your cheesecake filling and dump that on top. 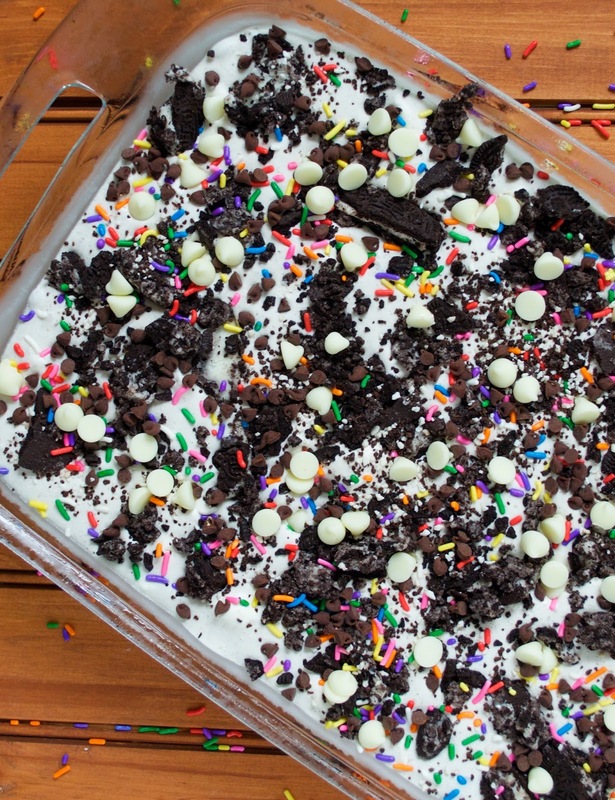 Add even more Oreo chunks and other decorations to the very top and then freeze this bad boy for as long as you can (I did mine overnight). The dessert is as easy as it is fun as it is AWESOMELY DELICIOUS. 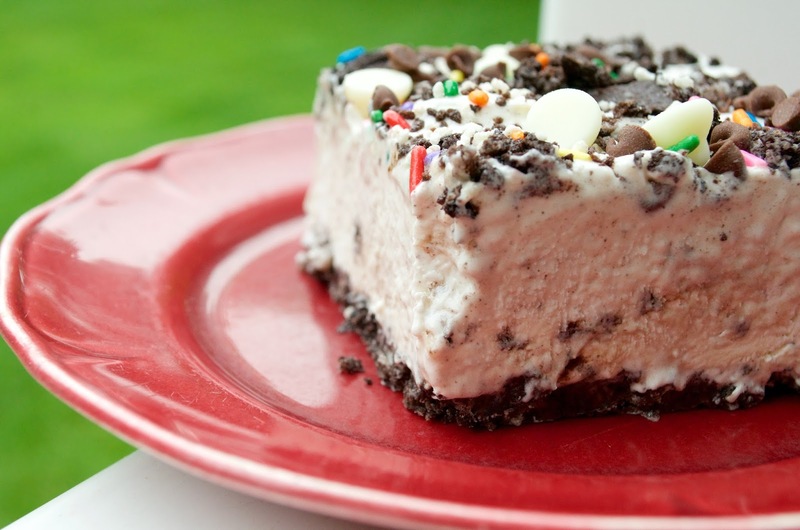 You may never make cheesecake the same way again. 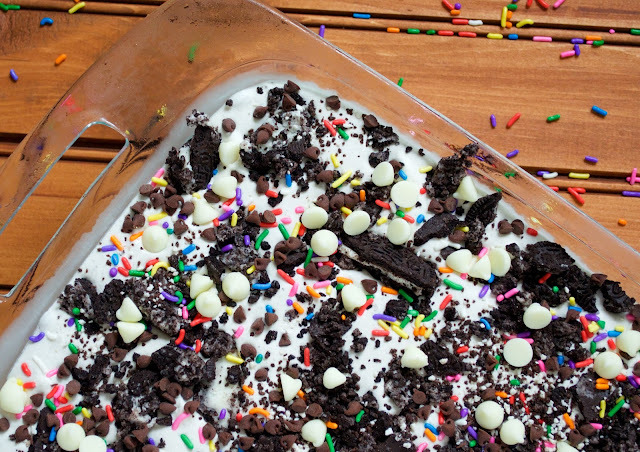 Adapted from Kleinworth & Co.
Crush 2 out of 3 rows of Oreos and spread them out in the bottom of a 9x13 baking dish. Drizzle melted butter over the Oreos. In your mixer or with a hand mixer, beat softened cream cheese. Add the dry pudding mix, milk, and sugar. Carefully fold in cool whip. The mixture will be quite soupy! 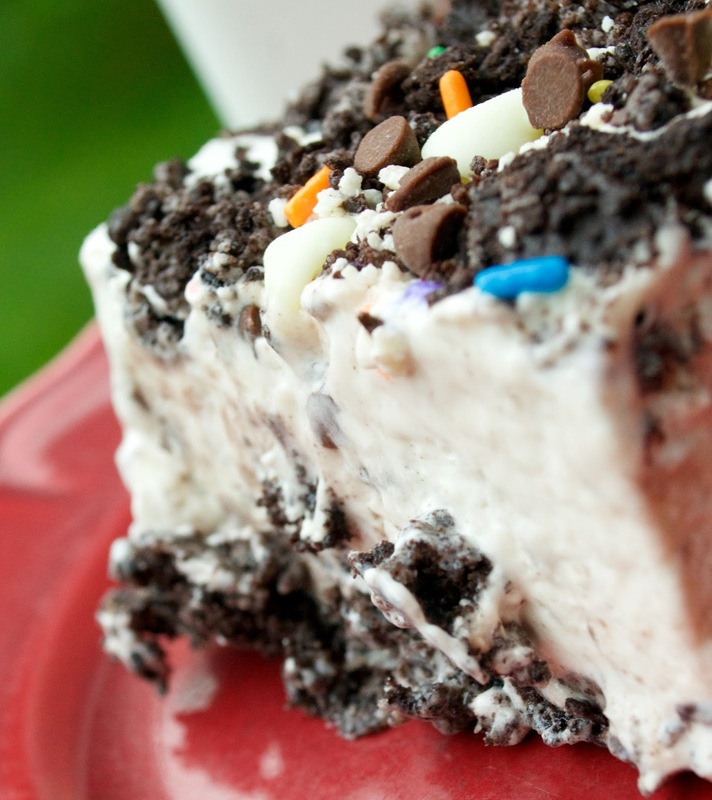 Pour cheesecake mixture over the Oreo layer. Crush up remaining cookies and sprinkle on top. 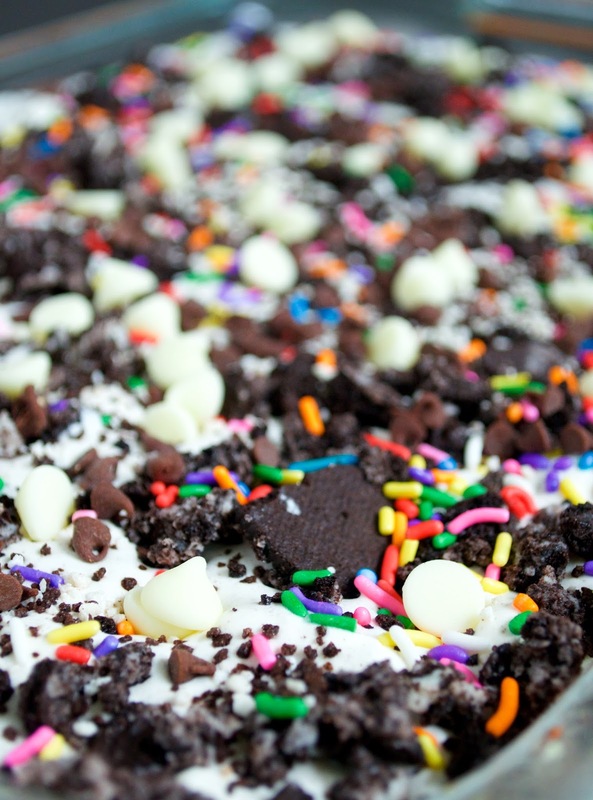 Drizzle chocolate sauce over cheesecake or add any other toppings such as sprinkles, chocolate chips, etc. Oh my stars, does that look and sound incredible. 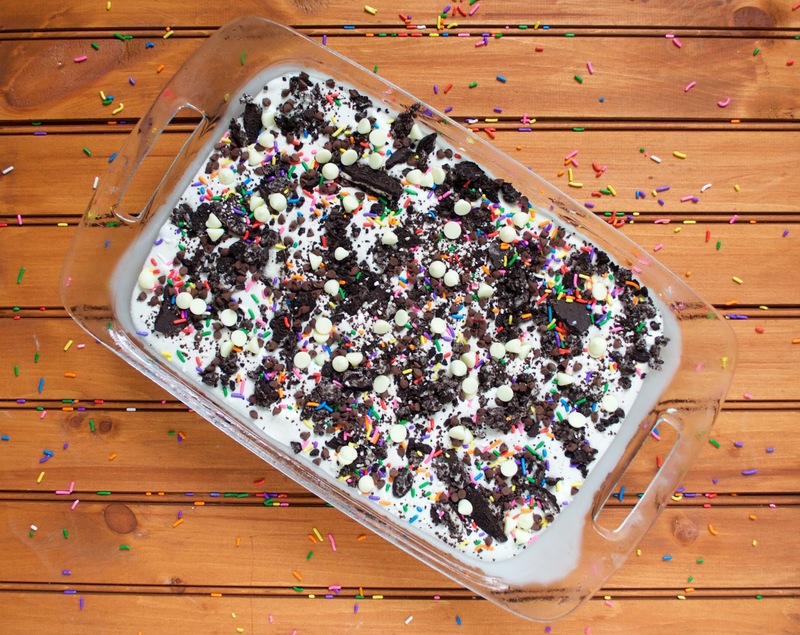 Thank you so much for sharing this truly sweet recipe with us. Yummers!!! Oh this looks so delicious! I want to make it so bad, but as far as I know we don't have instant pudding here in Sweden. I'll try and look for it though. These post are the WORST... because they make me want to eat all the things. Ha! This looks amaaazing. 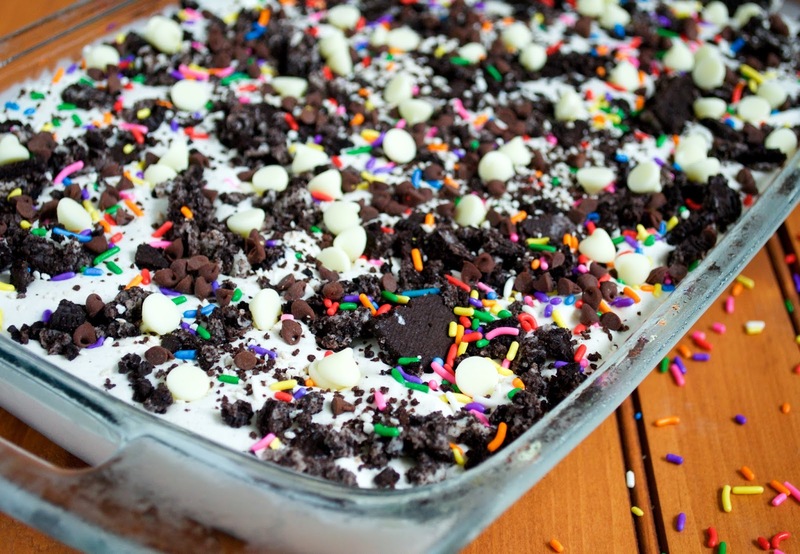 Looks so delicious and perfect for summer! May you NEVER loose you sweet tooth. Take care SaraLily!